Welcome to Hale Honu, or Tutu's house! We lived in this house for 7 years before we returned to the mainland to join our grandchildren, and hope you will find it as comfortable and accommodating as we did! This large modern home in White Sands Beach Estates. lies only 3/4 miles from famous Kahaluu Beach Park, which provides some of the the best snorkeling on all the Islands. You can plan trips to South Kona to see the coffee and macadamia farms, Kohala to visit the fabulous resorts, or just stay local in Kona and enjoy the snorkeling, dining, and relaxed way of life. While we are certainly not a 4 star resort, we provide a enjoyable family ambience and amenities that will let you experience life on Kona like a local. 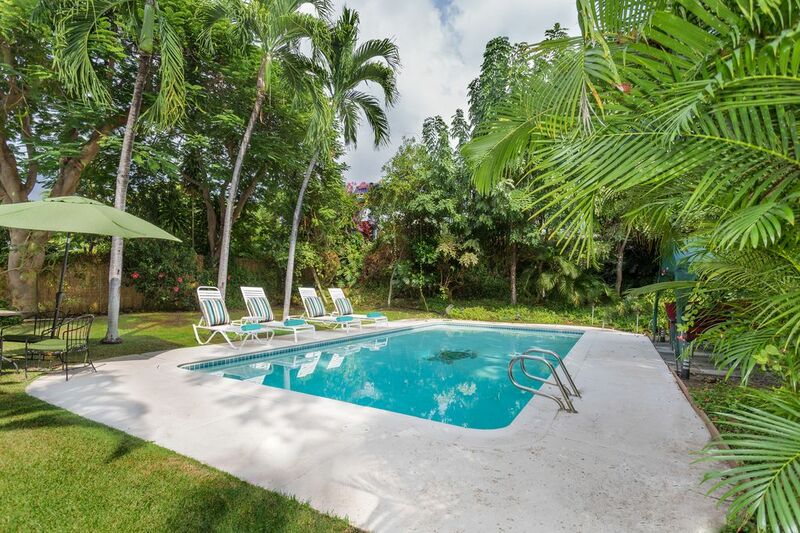 You can enjoy a lovely pool in a beautiful garden, play croquet on the lawn ,chill in the hammock, BBQ on the front lanai, or use the front lanai loungers to read or just stare at the horizon with a cocktail. * King size bedroom with lanai overlooking pool and adjacent bath. Amenities: Phone, TV, Cable, VCR/DVD. stereo, CD Player, Full Kitchen, Microwave/Convention oven, Dishwasher, Two Refrigerators, Ice Maker, Cooking Utensils provided. Linens provided. Washer/Dryer, Private Pool. No Smoking in the house, only on the Lanais, please. Beach Chairs, Towels, Boogie Boards, Pool Floats, Hammock, Snorkeling & Croquet Equipment provided. Activities: Near Shopping, restaurants, Cinemas, Sightseeing, Swimming, Snorkeling/ Diving, Boating, Sailing, Surfing, Windsurfing Para sailing. If you aren't looking for a 4 star resort experience, but rather want to enjoy a local and comfortable family experience, please inquire as we would love to host you. Thanks in advance for your inquiry! Hawaii was my dream; to live here in retirement and have my children come and visit. Then the grandchildren started to come, and Hawaii was just too far away for this Tutu (Hawaiian for grandmother) and so we moved back to the big Big Island. This is a family home, in a quiet neighborhood near the beach, able to accommodate up to 10 people for memorable family get togethers and occasions. The lush, garden setting with pool is just magnificent. Tropical birds sing in the trees, plumeria fragrance the air, charming geckos climb the walls, and screens keep out critters we don't want inside. We so enjoy the tropics that we've adapted to them - so no air conditioning, just gentle fans cooling each room. And because it's the tropics, you may find mosquitoes in summer in some areas of the island (occasionally including ours). A mere five minute walk to the white sand beaches of Kailua Kona. Lots of space but wish we would have selected a home with air conditioning. The house was nice and a good location. I would recommend this home to anyone. House has a great location close to town and beaches. The pool is wonderful and all the pool toys. There was enough room for 5 adults and 5 children. Parking nice next to house. Only downside is there were some large bugs in downstairs bedrooms. It’s tropical yes and the great yard allows some bugs to get in. The kids were a bit alarmed. Kitchen has everything needed and upper deck dining option is wonderful. Also communication with manager is slow and basic. Great location and space for the nine of us! This comfortable Hawaiian home gives you a feeling for what Hawai use to be. We have stayed here several times and always enjoy the big porch and living area. They provide extras like snorkeling equipment and beach chairs as well as boogie boards. A party of 9 people, we were worried about bedding and personal space with kids and grandparents. Also with an athlete for the 40th Kona Ironman championships we were considering his prep etc. What a great choice. We had more than enough beds, the beach was only 500 metres down the road and the turtle beach 1 km. The food shops no more than 5 min, and main town, bus or 15 min drive depending on traffic. Ironman traffic is busy so you cannot avoid this or the bicycle entourage on Ali’i Drive, though it is wonderful for walk/run. The house is big and open, cool and well equipped, when away from home, it was a great choice. Pool n garden well cared for, extra beach equipment and pool gear a great edition so you don’t need to buy more things, it’s all there. Including snorkels and water shoes, beach mats and chairs. As for bugs, use repellent, but the birds n lizards are so cute! The local cats n dogs visit occasionally as well, Just like home. Would rebook if bringing family back for next ironman. Thankyou for opening up your house, it was exactly what we needed. We were 9 adults in the house and it never felt crowded. Location was excellent, close to beaches, paddling and Kona. We have no complaints and would rent Tutu's again.